Rampage: Secret Squadron Goranger: Christmas Release! Secret Squadron Goranger: Christmas Release! It's Christmas time, everyone, and so good ol' Santa Claus has brought you a special present, and a day early nonetheless! It's the next two Goranger episodes, hooray! 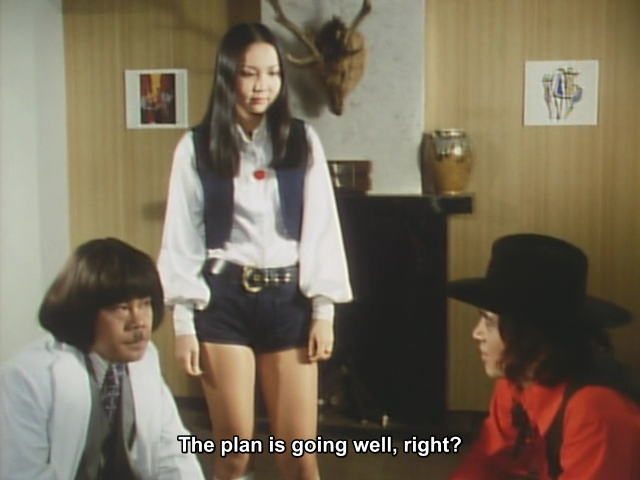 Well, if the plan was making Daita look silly, it sure is. First up, episode 49 involves a plot by the Black Cross Army to get their hands on Franken #1, an invincible robot, which can withstand even the Goranger Storm! Peggy and Asuka are lured into a trap, and must build it for them. In episode 50, our heroes are caught by surprise when EAGLE receives a distress signal from a base, claiming the Varidreen has attacked it! Has the Black Cross Army framed them, or were they really betrayed by one of their scientists? 50 - The riddle is Daita's way of warning the others of a trap. He draws seven circles on the floor, and Shinmei understands his signal. The pun this time is that "circle", in Japanese, is "wa", while "seven" is "na". When you put those together, you get "wana", which is trap. Neat, huh?